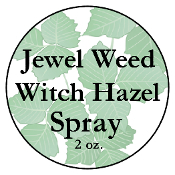 A spray of Jewelweed Witch Hazel to help ease the itch, and discomfort of Poison Ivy Poison Oak, Sumac etc. Spray on rash to help dry and reduce the healing time. Witch Hazel, Alcohol, Jewelweed Extract 4 oz.